For some, the keyboard has replaced the pen. Of course, the ball point has long since replaced the plume. Fortunately, for you retro folks, you can still enjoy the lovely plume of the orange sea pen (Ptilosarcus gurneyi – “Ptilo” is Greek for feather or down) gracing the subtidal (if you’re a diver) or in sand or mud of the the lower intertidal. On the Kitsap Peninsula, I’ve only seen them intertidally at the Southworth ferry dock. In fact, I dropped a camera in the drink trying to take a picture of it. That salt encrusted camera carcass now hangs in my office. … My new camera is waterproof. … I wonder if they’re higher in the intertidal at the ferry docks because the ferry wash kicks them up and they reroot at a shallower depth? Hmm, need more info for that question. Let me know where you find it intertidally. When exposed on a low tide, this beauty squeezes out its water and recoils into something resembling a small orange brain. Add a little water though, and presto! They expand to a lovely plume, feeding on the plankton that wash past. Now for the even cooler part… They aren’t really a single living creature with a body and some sort of feathery feeding appendages (like a feather duster worm or plumose anemone). They’re related to corals, which have many tiny polyps that build and add onto the calcium carbonate base they all share. The hundreds of polyps in a sea pen have different functions but work together as a single organism. The big “stem” of the pen is made up of one enormous polyp that no longer has tentacles and formed a big bulb at the bottom that it uses to fix itself in the sediment. The feathery parts of the pen that branch out from the stem are made up of tiny polyps that feed on plankton, intake water or produce sperm and eggs. 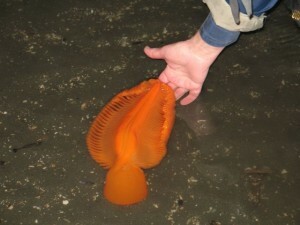 Orange sea pens may fall prey to several species of sea stars, but are the primary prey of the striped nudibranch (Armina californica). Alas, the pen is not mightier than the slug.